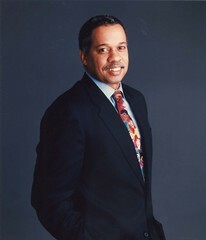 Senior political correspondent Juan Williams of National Public Radio and other national media will be the keynote speaker at the summer meeting of the Vermont Business Roundtable, which will be held on June 18 at the Sheraton Burlington Hotel and Conference Center. Williams will deliver “The Latest from Washington – An Insider’s View” following dinner and a brief awards presentation. Roundtable members and government leaders from across the state are expected to attend the event, and non-members are also encouraged to participate. Dubbed a “Summer Celebration,” the regular meeting of the Roundtable’s membership will culminate in an evening of social networking, celebrating leadership and learning political insights from one of the nation’s leading political analysts. Williams is the senior correspondent for NPR, a political analyst for Fox Television, and a regular panelist for Fox News Sunday. In addition to prize-winning columns and editorial writing for The Washington Post, he is the author of six provocative books, including his latest release, “Enough – The Phony Leaders, Dead-End Movements and Culture of Failure That are Undermining Black America – and What We can Do About it.” The book presents a point-blank analysis of black leadership in America. As one of the nation’s most influential journalists, Williams is in constant contact with American political leaders from the President to members of Congress and the Supreme Court. His understanding of American history and his inside access to Washington politics give him a unique and informed voice as an analyst of current events. The Vermont Business Roundtable was created in 1987 as a nonprofit, public interest organization, comprised of 100 CEOs of Vermont’s top private and non-profit sector employers dedicated to making Vermont the best place in America to do business, be educated, and live life. For more information on the Summer Celebration, tickets to the event or the Roundtable and its projects visit: www.vtroundtable.org.